Modern Christians profess to be authentic, but would rather wrap ourselves in Christianese than Christlikeness. 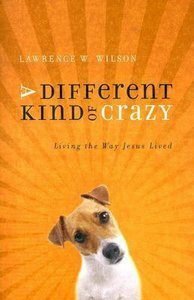 A Different Kind of Crazy challenges you to take Jesus? teaching, and make it your own. As author, Lawrence W. Wilson points out, Jesus did not say, ?Repeat after me, ? as if the faith were a set of arithmetic tables to be memorized and repeated on command. He said, ?Follow me.? Jesus showed us a way to live, from loving our enemies to remaining pure when society encourages us to indulge our desires. Are you ready to truly follow Jesus and experience a life your friends, family, and the world may see as A Different Kind of Crazy? Take a risk. Change your life. And grow more like Jesus. Includes a discussion guide to facilitate small group discussions. About "A Different Kind of Crazy"